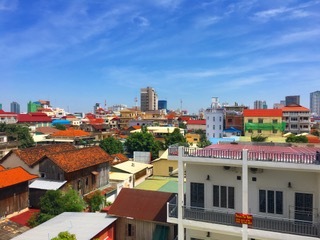 Varsha In Phnom Penh, the capital of Cambodia. 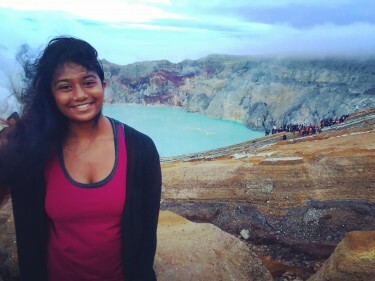 Varsha Govindaraju’s year as a Luce Scholar was a rollercoaster. As the sole scholar in Cambodia, she navigated a new culture, lived in a developing nation and adapted to a challenging work environment. At the same time, it was thrilling. She solidified her beliefs and goals; taught Indian dance to a group of Khmer teachers and parents; learned Khmer; formed a group of like-minded friends; became the proud owner of a motorbike and reconnected with family in India. Varsha (’15, anthropology and law, societies and justice) spent her first two months in Cambodia studying the Khmer language in Siem Reap. 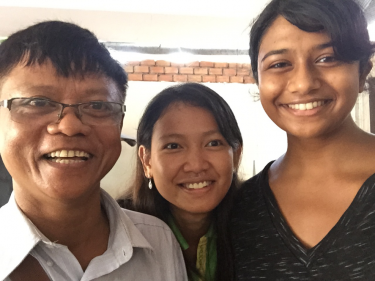 As the only student in her class, and one of two non-Khmer students in the entire language school, Varsha noticed people staring at her. Constantly. She asked her language teacher why. My Khmer teacher told me that people are staring because they are trying to understand me or something about me, and it’s not normally considered rude. She also said it might be because I’m Indian and have dark skin. This explanation helped her understand why making friends in Siem Reap was difficult. According to past Luce Scholars, studying Khmer in cafes would pique people’s interest, prompting them to strike up a conversation. Varsha was met with more stares. 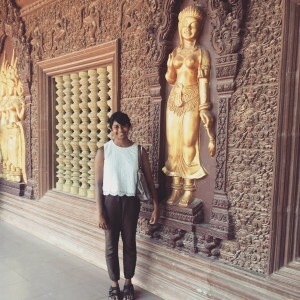 After two months of acclimating to Cambodian life in the smaller city of Siem Reap, Varsha was excited to move to the capital Phnom Penh. There, she would start her work placement at the Cambodian Women’s Crisis Center. The Luce program includes two months of local language classes. Varsha — the only student in her class — poses with her teachers. 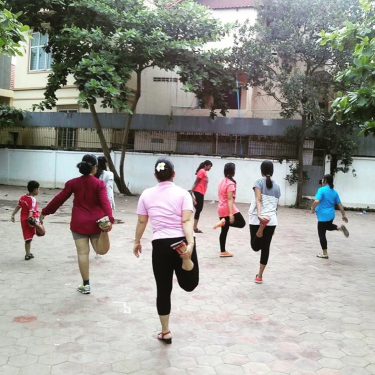 On her teacher’s suggestion, Varsha combined her love of Bollywood dance and Khmer studies to teach a dance class to women and children at a local school. 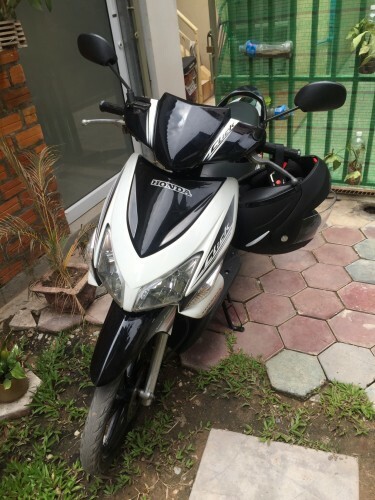 Varsha bought a “moto!” Her Khmer teachers taught her how to ride. 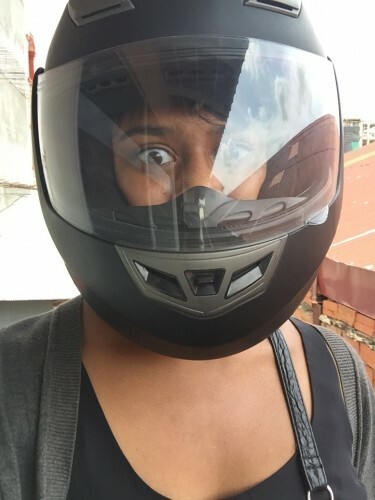 Varsha compares driving in Cambodia to navigating a game of Tetris. As an undergraduate, Varsha worked with victims of gender-based violence through SARVA (Sexual Assault and Relationship Violence Activists). 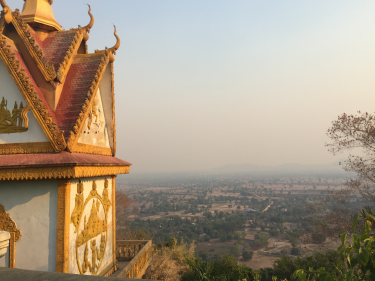 Because of this experience and her interest in learning about domestic violence in other cultures, the Luce Program placed Varsha at the Cambodian Women’s Crisis Center. Designed for emerging leaders with little to no experience in Asia, the Luce Scholars Program provides stipends, language training and individualized job placements in countries throughout Asia. The year begins with an orientation, and Luce Scholars have several opportunities to meet throughout the year. Working for the Cambodian Women’s Crisis Center (CWCC) is where I had to adapt the most. After working at several jobs that emphasized productivity and efficiency, I became immersed in a professional culture that valued face-to-face communication and relationships above all. My email savvy was no longer helpful, as in-person communication was where the real work got done. In our office converted from a Khmer house, I found myself walking up the narrow stairs to talk about a specific project and often ended up learning or making progress on something entirely different. I’ve come to value the relationships I built with my coworkers and the importance of learning directly from them. At the Cambodian Women’s Crisis Center, Varsha wrote grants and rewrote English documents to be more effective fundraising tools. While Varsha recognized the importance of this work, she was eager to get out into the field and work with local communities. Through various outreach programs, I traveled to villages outside Phnom Penh and Kampong Thom, to meet and chat with men who are abusers in their communities as they receive anger management training. Meeting these men was initially incredibly uncomfortable, as one even showed up drunk to the training. However, their commitment to changing their behavior was stunning. I met wives who spoke frankly in women’s support groups about their husbands still beating them, and yet they still managed to host events in their village to help other women. These conversations, while difficult due to my limited Khmer abilities, have given me direct insight into rural domestic violence issues and how CWCC can help. My Khmer language training gives me the opportunity to not only understand what people are saying, but laugh with them, cry with them, and show I care enough to try and communicate. 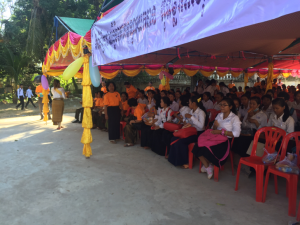 For UN Women’s Day, CWCC hosted a march through a rural village near Kampong Thom, involving the community to stop cycles of domestic violence. Going into her Luce year, Varsha was considering a career in international law. However, over the course of her work in Cambodia, she came to believe that locals are the best equipped people to help their communities. As a foreigner, she could never have the same innate understanding of the culture. To that end, Varsha is now in law school at the UW, on a William H. Gates Public Service Law Program scholarship, with the goal of being a public defender. Moving to Cambodia, leaving the traditional path to move abroad for a year has been about investing in myself. I’m the first to say that being in a developing country from a privileged background can be a difficult adjustment, and it’s not for a lot of people if they don’t hold the right mindset. If you let every time you vomit, see bugs and run into trash on the streets define your experience in the country, you’re going to have an awful time. But, if you take it as an opportunity to understand poverty, development, and recognize the privileges your home country brings you, you’ll leave forever changed. 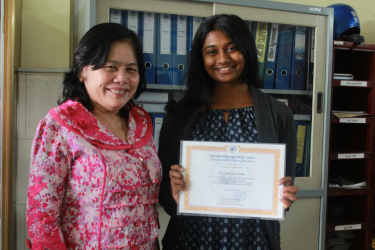 With her supervisor celebrating the completion of her work. Varsha’s Luce cohort had 15 people. They stayed in touch regularly through a group chat, visiting each other and had a few official Luce meet-ups throughout the year. Living in Cambodia made it easy to travel throughout Asia. Varsha visited Japan, South Korea, Indonesia, Myanmar, Thailand, Laos, the Philippines, China and India. Here she is after a hike in Java. 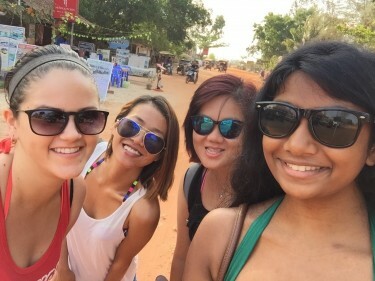 Varsha and friends from Phnom Penh spending a weekend in Sihanoukville – one of Cambodia’s beaches. 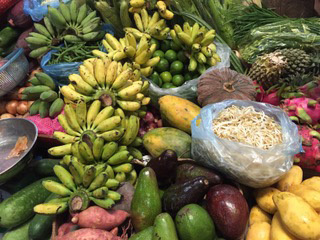 Cambodian produce at Toul Tom Pong Market in Phnom Penh, such as dragon fruit, mangoes and jackfruit. 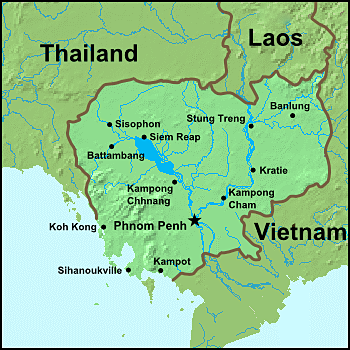 Varsha also traveled extensively throughout Cambodia. Pictured here is Battambang, Cambodia. 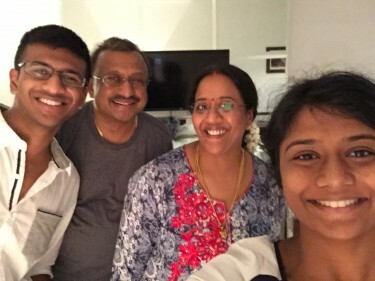 Living so close to India, Varsha got to visit family she hadn’t seen in 14 years.She’s pictured here with her parents and brother. 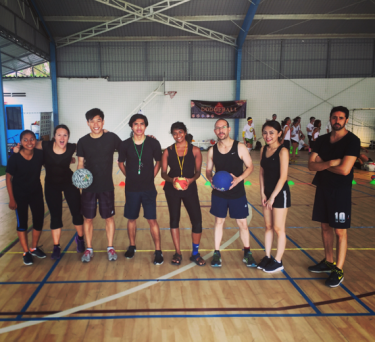 Varsha’s dodgeball league quickly became one of her favorite activities in Phnom Penh. A farm in Oshu, Japan hosted the Luce Scholars. 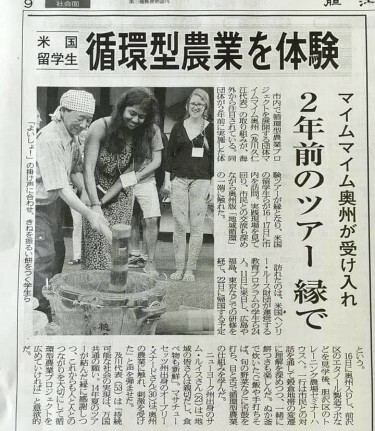 Here, Varsha learns to hammer Mochi, and the local paper was on site to capture the event. The Luce Scholars Program application process is supported by the Office of Merit Scholarships, Fellowships and Awards (OMSFA), a UAA program. OMSFA works with faculty, staff and students to identify and support promising students in developing the skills and personal insights necessary to become strong candidates for this and other prestigious awards. 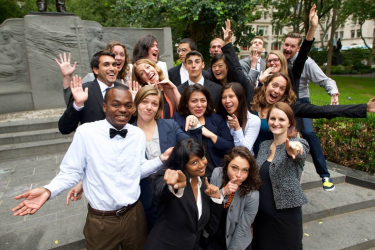 The UW campus application process for students interested in Luce Program (and other scholarships supporting graduate studies, research, and community engagement around the world) will get started this spring for 2019-20 awards. Learn more through the Global Fellowships Prep program.